The number of pages after folding. File templates will help you set up your file! If you select "Varnish" the product will be covered with a slightly glossy aqueous coating. Leaflet size refers to the size after folding. 300 gsm paper or heavier is delivered pre-creased but not folded. Folder or Leaflet Printing can be used for all your needs. It couldn’t be truer. 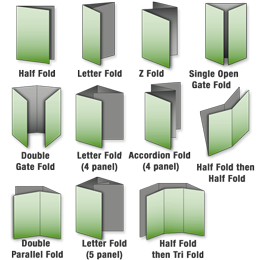 Due to their structure, the leaflets help to distribute a lot of information without overburdening your readers. When the content grows, you do not necessarily need to make a cornelian choice on remodelling your text, you simply have to add pages to your leaflets. Moreover, 1-2-Print offers a variety of folds to differentiate your leaflet from those of your competitors. 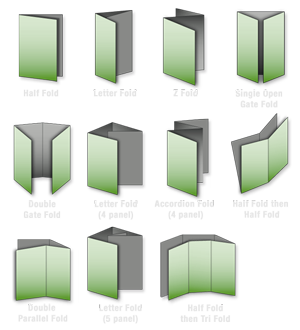 For example, the impact and the reading of your printed leaflet or folded flyers will not be the same if you choose a letter fold, a zigzag fold, a gate fold or a window fold. We offer free leaflet printing templates to assist you with your custom design. Keeping this in mind, you can enjoy creating your leaflets or brochures. 1-2-print offers you to print online several types of leaflets at very competitive prices. Leaflet printing is possible in all formats you want, from A8 to A4 including DL, on any paper you like, from 4 pages to 16 pages. To order your leaflets online in our website go to the “leaflets” category and choose the final/folded format. Then please select the number of pages and quantity. Enter your delivery address and make the payment before uploading your files and that’s done! You will receive your leaflets at home in a jiffy. The DL leaflet, no matter the number of pages, may be used, for example, as an information add-on for your advertising campaign, or as a commercial document for your business. With a reduced amount of pages, the leaflet becomes increasingly a way of communication for postal mailing actions. The long format leaflets, such us A5 Long for example, are more and more used to print cinema or theatre programmes or in the tourism industry. Small prospectuses A6 or A7 sizes are more often used as instructions notices or brief information about products. They are also particularly used to print monthly programmes or guides for events or parties in bars or nightclubs. There will always be more original formats for your leaflets such as square or in special formats. With leaflet printing on a special format you can ensure not be unnoticed. 1-2-Print put the price / quality ratio as a paramount element of its philosophy. Therefore, you can do your leaflet printing with confidence. For instance, we only print on high quality paper to avoid marks on the folds and grooving is automatic for the thickest papers. For the most demanding people, we offer protective varnish or lamination option. Entrusting your leaflet printing jobs to an online printer like 1-2-Print ensures you quality, rapidity and simplicity at unbeatable prices.